I cannot believe how quickly 2013 year went. 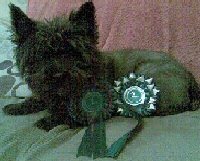 My cairn Tinker had a back and neck injury and was under the Physiotherapist and Osteopath for most of the year hense, not many agility shows. The good news is that he seems to be fully recovered and is back to actually wanting to do agility again. His little face says it all! Those of you who have a Cairn will know what I mean! It was a good year for agility – no flooded fields or cancelled shows but the weather was certainly not at its best. It just couldn’t make up its mind what to do! Deidre and Rhum started the year very well and moved up to Grade 5 in January. Well done, Rhum. Margaret and her Cairn Brodie won into Grade 2 in July much to Margaret's delight. Margaret keeps me amused with her tales of her Cairns, Corrie and Brodie. I am not sure which one is the most naughty or stubborn as far as agility goes, just like my Tinker. I think they must be related? One day you think they have cracked it and grade 7 here we come, at the next show you wonder whether they have learnt anything at all!!! We both know they are perfectly capable of doing agility; it is whether they want to do it that day! Tinker certainly keeps me on my toes but I would not change him for the world! Sue with her Westie, Mac also had a very good start to the New Year. In February, Sue wrote to let me know that Mac had enough points to move up to Senior Performance for the UK Agility. What a brilliant start to 2013. Then in June, Mac managed to win into Grade 2 at a Kennel Club show. I don’t think Mac has managed to go up to Grade 3 which may or may not be a good thing. It has given Mac time to get used to the higher grade courses. In April, Janet Wilcox and Dougie a Cairn terrier, joined the league. Dougie is owned by an elderly lady called Pat who lives in Laleham. Janet has been walking Dougie since he was around 9 months and he is her Goldie's best friend. Janet does agility with her Goldie and started agility with Dougie. They started competing seriously this year (2013) and for his first year has done very well coming 10th Overall and 3rd in Grade 1. Louise and Millie have had a good year, too. They came 3rd in The Agility Club Annual Awards for 2013!! What a star! 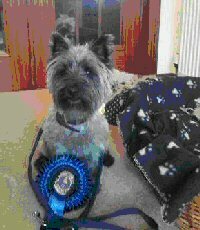 Well done to both Louise and Millie the cairn terrier. Louise also had news on her ‘new cairn’ Mickey. Louise decided that breed showing was not for Mickey (although he did very well in the show ring) as he was starting to do agility and enjoying it. As for obedience Mickey has passed his Kennel Club Good Citizen Bronze Award in July. Well done Mickey and hope to have some agility results from you in 2014. 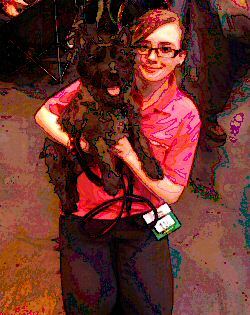 Kim and her Scottie X, Pickles are also new to the League and joined us in January. I think Pickles has gone up to Grade 4 now? What amazing results! Well done, Pickles who is 3rd overall. Melissa and her Cairn X Widget joined us in March. What a star Widget is! She started the League as a Grade 4 agility dog and has now gone up to Grade 5. Widget came 2nd as our overall winner, just behind Tessa. Well done! Melissa and Libby, her Cairn Terrier Libby, who by the way was born not too far from where I live, was also new to the League this year, joining us in October. Those of us with Cairns will sympathise with Amanda. If it is any help, Tinker still does this to me four years on! Don’t give up, She will suddenly realise that the agility is more fun). This is something I have come across in that the trainers have only had agility training experience with Border Collies and terriers are a completely different type of dog to train in any discipline! I haven’t heard from Amanda in a while so hope she is getting the advice she needs and is carrying on? 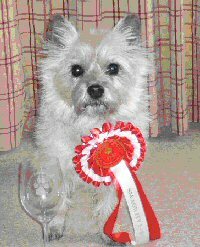 Jan Drinkall tells me that now Alfie, her daughter Megan’s cairn, has moved up to Grade 6, he is finding the agility courses are a lot harder. However he did manage two firsts, a third and a fourth placings in Grade 6 – something I dream of Tinker doing one day (may be). Megan has a new agility dog a border collie called Ruby who she has done very well with. I think Megan and Ruby are in the Crufts YKC in March 2014. I hope you do well Megan! In April Jan wrote 'Megan had a cracking weekend with Ruby though, shame she's not a Scottish Terrier! She won four Junior classes and a G6 jumping and agility. One more agility win and she'll be Grade 7! Think I forgot to tell you that Alfie just missed out on qualifying for Crufts again at Wyre a couple of weeks ago. He was 3rd in YKC Agility Dog of the Year. I think Megan and Ruby must be Grade 7 by now? Amazing results, well done. As Jan said, shame Ruby isn’t a terrier from Scotland!! Word from Julia Bond and Max her Westie is that they had not done many shows but still wanted to stay in the League. That is great! May be 2014 is the year for Max? And now for the results for 2013!! 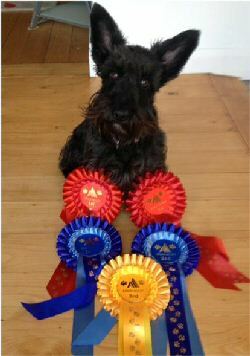 The overall winner of the Scottish Terrier Breeds League 2013 is … Adrienne Atkinson and Tessa, her Scottie X. Tessa is a Grade 7 agility dog and hopefully will become an agility Champion very soon. They managed to get 476 points throughout the year. Tessa who I think is now 8 years young has been our overall winner in 2011, 2012 and now 2013. What a star she is. The Overall Runner up for 2013 is Widget who belongs to Melissa Issacs-Beadell. 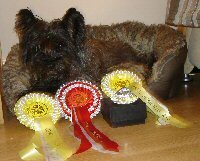 Widget is a cairn cross and this was her first year with the League. They got a total of 432 points - not too far behind Tessa. Well done Widget and hope to get a lovely photo of her with her rosette. Congratulations to each of our Agility Grade winners. But, there are several handlers who joined but I have never received any results or further communications so this total may not be correct. I do know that a couple of our handlers have had serious injuries to their dogs who are recovering but will not be doing any competitive agility and who wished to remain with the league. If there is anyone who wants to join the League, please get in touch by email ockcairns@yahoo.com or telephone 01869 322996, it is free to all terrier breeds that originated from Scotland; West Highland Terriers, Cairns, Skye, Scottish Terrier, Dandie Dimonts as well as any crosses. 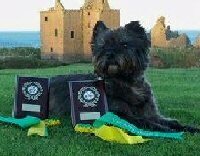 I an happy to continue with the Scottish terrier League so do send me all you clear run wins from 1st January 2014 to 31st December 2014. And finally I would like to congratulate all the winners and to wish you all a very happy new year and good luck in agility. The agility season seems to be coming to an end but there are the Winter Leagues to look forward too so we will not be missing out on our agility too much. Please welcome Janet Wilcox and Dougie to the League. 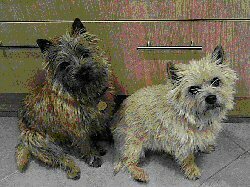 Dougie is a Cairn Terrier owned by an elderly lady called Pat. Janet had been walking Dougie since he was around nine months and he is now four years old. This team started competing seriously in March this year. 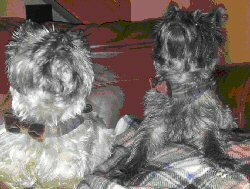 Janet tells me that Dougie is a ‘Lindcoly’ bred Cairn Terrier and is related to Widget. What a small world we live in! He is best friends with Janet’s Goldie. I am very pleased to report that Brodie, owned by Margaret O’Connell, has won into Grade 2 by winning both the Jumping and Agility class in July and coming 2nd in another Jumping class at the same show. Sorry but I don’t know which show this was as Margaret forgot to let me know. What a way to win into Grade 2! Louise with Milly had a fabulous run at the Weald Agility Show in October by winning the Grade 2 Agility Class. Uunfortunately, it wasn’t a clear run as Louise says it was handler error picking up five faults. Despite this it was a good win a- the course was very tricky with lots of E's. She has had her second Cairn Mickey measured so they should be competing soon and is pleased that he will not be starting his agility career in Grade 3! Mickey has also passed his Kennel Club Bronze Good Citizen Award. Well done. Sue and Mac are now Grade 3, winning the third jumping course at the Golden Valley Show in June. Mac is also Champion Steeplechase – well done. Nikki will be running Bramble - the new addition to the family, and has a younger person running Ollie. So far no results Nikki, so hope there will be lots to add fairly soon. As for Tinker and myself, we haven’t done many shows this season as he has had a back injury and just refused to do any agility. I have taken him to an animal Osteopath in Wantage who has done wonders and Tinker is now enjoying his agility again. We went to two shows recently and of course Tinker was up to his usual tricks wanting to run his own courses! Maybe one day he will do as I ask! Our overall leader so far is Melissa with Widget with a total of 404 points. This is their first year in the League. Widget started as a Grade 4 dog going up to Grade 5. Congratulations to them both. In 2nd place and not too far behind our winners is Adrienne with Tess on 366 points. They were our last year’s winners. 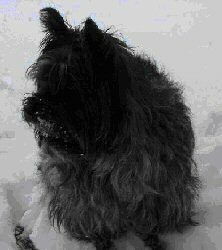 Tessa is a Scottie Cross although in her pictures she does look just like a Cairn. Tessa is a Grade 7 dog. In 3rd place on 169 points is Kim with Pickles. This is their first year with the League and Pickles is also a Scottie Cross running as a Grade 3 dog. 4th in the League Tables is Sue with Mac on 90 points. Mac has just become a Grade 3 agility dog so well done to him. In 5th place is Brodie, owned by Margaret. Brodie has got 64 points so far and is now a Grade 2 dog. Margaret says she doubted he would ever go up to Grade 2 but he has proved her wrong! Brodie sounds like he is very much like Tinker and will run his own course rather than mine, so may be I just have to be patient! I am not sure what has happened to several of our members as I have not received any results of any wins. Does this mean that they just haven’t won anything or forgotten to send me the results? Despite the weather, the agility season has at long last started! I don’t know about anyone else, but I am looking forward to running Tinker again. Last year was a waste of time as all the shows I had entered were cancelled. Just hope it is not going to be a repeat of last year. I would like to welcome two new members to the League. First is Melissa Isaacs-Beadell with Widget, a Cairn X running as a Grade 4 dog. Widget is about six years old though Melissa is not sure of her exact age as she is a rescue. From the results that Melissa has sent in this year, I don’t think she will be in Grade 4 for long! She is our current leader so far! Well done, Widget. Welcome also to Kim Coleman with Pickles, a Scottish Terrier X Poodle who only started the year as Grade 3 but has now won into Grade 4 with her latest wins. 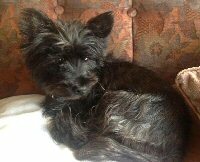 Pickles is joint 2nd in the League at the moment with Tessa, who strangely enough is also a Scottie X. Tessa looks more like a Cairn while Pickle could certainly pass for a Scottie. Melissa and Widget are in 1st place with a whopping 138 points in only eight shows so far this year. Well done to you both. Widget started this year as a Grade 3 dog and has moved up to Grade 4 but will soon be Grade 5! In joint 2nd place are Adrienne Atkinson and Tessa, last year's winner, tied with Kim Coleman and Pickles with 51 points each. Tessa has more Agility points while Pickles has more Jumping points. Tessa has been to six shows while Pickles just the one show which was over four days. Megan and Alfie are in 3rd place with 35 points but they have only been to three shows so far so watch out you leaders! In 4th place is Milly, belonging to Louise Palmer. I think Milly thinks Mickey is getting all the attention. Latest news from Jan Drinkall, Megan's mother, is that Megan and her Cairn Alfie came 4th in the Junior YKC Agility at Crufts 2013. Well done to them both. She has worked so hard with him. They just missed out qualifying for Crufts 2014 at Wyre a few weeks ago, but he was 3rd in YKC Agility Dog of the Year. 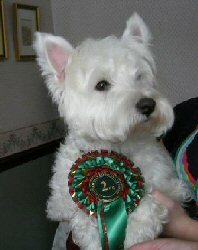 Sue Seal and her Westie Mac went to UKA Valentines show at Cheltenham and what a day they had! They won 3rd place in Novice Agility and a 2nd in Novice Jumping so they now have enough points to move up to UK Agility Senior Performance. Well done to them both. 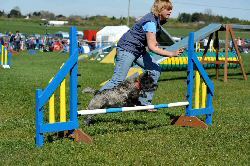 The good news from Nikki Barbar is that Ollie is doing agility again but has a younger, fitter handler so look out for his results soon. Nikki is planning to run Bramble this year so good luck to them. As there isn't much other news, I thought a few photos of our dogs would do nicely. Libby in the snow. Her thick coat kept her warm and thankfully she had not been to the grooming parlour yet. We shall sing you a song! Jodie, belonging to Suina Rogers, relaxing. Brodie with his rosette. Owned by Margaret O'Connell. Widget (third from the left) with her friends. Milly, owned by Louise Palmer winning the Agility 1-3 Comp at South Eastern, Sands Farm. Gillian Pringle’s Indy with his rosettes. 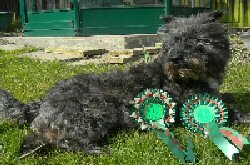 This is a picture of a very proud Miss Pickles with all her rosettes. 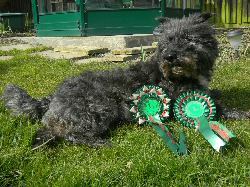 Tessa who belongs to Adrienne Atkinson, with her rosettes. 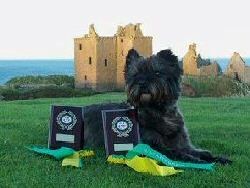 They were our overall Scottish Terrier Breeds League winners for 2012.